On this 5-hour jaunt off the coast of Split, enjoy a stop at beach bar, take in stunning views of islands on the horizon, and go snorkeling in the Blue Lagoon. This 8-hour tour takes you to some of the most remarkable places off the coast of Split, including the shimmering coastal town of Hvar! Escape with us to the sandy shores of a lush island chain and go swimming and snorkeling. On this full day tour, visit the Blue Cave, go swimming and snorkeling off the shores of the Pakleni and Šolta islands, and enjoy a laid back adventure exploring some of Croatia’s most picturesque seascapes. Starting from €550 Euros for 6 hours, with miles included for visits to Blue Lagoon and islands of Brač, Šolta, Trogir and Drvenik. 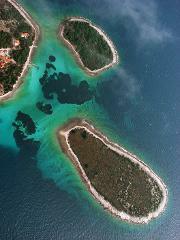 For additional miles to visit islands of Hvar or Vis look into extras! Multi-day options available.